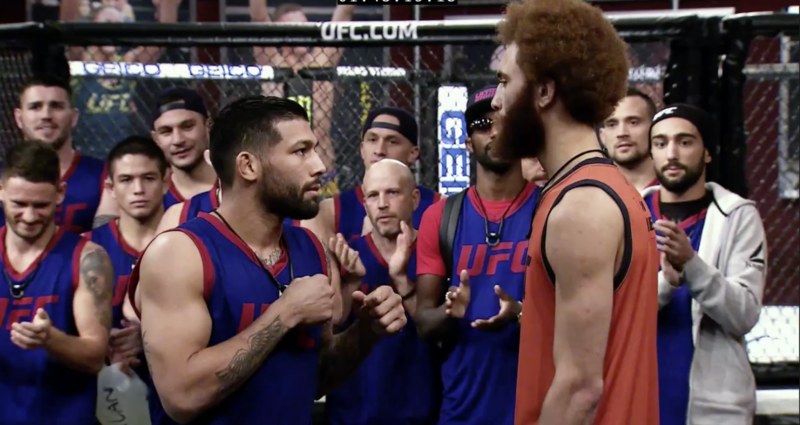 As a member of The Ultimate Fighter: Undefeated cast, Luis Pena is still far off from his goals in the fight game, but when asked if he wouldn’t mind becoming the first Italian to win a UFC title, “The Violent Bob Ross” is all in. Okay, so how did Pena, who was raised in Arkansas and fights out of Missouri, get in with guys like Marvin Vettori and Alessio Di Chirico when it comes to waving the green, white and red flag? There you go. It’s just another intriguing wrinkle to add to the story of Pena, whose nickname alone made him one of the most talked about members of the TUF 27 cast even before the show began. In that way, Pena’s story is not unique, because each of the competitors on the show has had their own struggles to make it to this point, even though some will look at those who ultimately make it to the UFC as folks who got there through a game show. It was the old knock on TUF from its beginning in 2005, and while that has quieted over the years, there are still some who hold that belief. He’s already been doing it step by step, whether as a wrestler with Olympic aspirations, an amateur MMA fighter, or a pro on the regional scene. And it’s clear from talking to him that hard work and sacrifice aren’t issues for him. “A little over a year and a half ago, I was essentially living in a closet in my gym as an amateur fighter just so I could make it into the professional ranks and hopefully one day make it into the UFC,” he said. Days like that will let you know in a hurry whether you’re built for this or not. Pena could have made a phone call to family and friends at any time to say, “Hey, can you send over a few bucks?” but he didn’t. These days, as Pena tells his story, those back home are hearing about his struggles to get here for the first time, and while he appreciates their concern, he wouldn’t change a thing. It’s almost as if he’s embracing the tough times, returning to them each time there’s a bad practice or dicey moments in a fight. That’s a grit he’ll never lose, so he’s not going to regret those days. He embraces them. That’s rare. So when he showed up with a 4-0 pro record to tryouts for TUF, he knew there would be pressure to succeed, but he was fine with that. Now, he’s got to win three times to get a UFC contract and a place in what many believe is the sport’s toughest weight class. According to Pena, it’s perfect timing.